The Roscoe Medical Knee Scooter offers increased comfort and ease of mobility to patients who cannot put weight on their foot or ankle, but want to remain active. The Roscoe Medical Knee Scooter offers increased comfort and ease of mobility to patients who cannot put weight on their foot or ankle, but want to remain active. 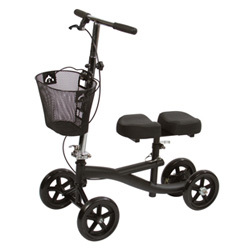 With its four large wheels and padded knee platform, the Knee Scooter is perfect for indoor and outdoor use. The offset post on the aluminum knee platform allows for right-to-left adjustment in seconds - no tools required. The Knee Scooter is equipped with an easy folding mechanism that collapses using a thumb release lever and fits beneath the raised knee platform for ease of storage and transportation. Recommended Patient Height: 4'11" to 6'6"
Adjustable Handle Height: 31" - 41"
Knee Pad Height Adjustment: 17 ½" - 22"